View More In Upholstery & Trim Tools. Are you a car lover? Do you need to do some modifications to your car? If you say yes, no matter whether you are a professional mechanic or a DIYer, XOOL trim removal tool kit is the best choice you for! 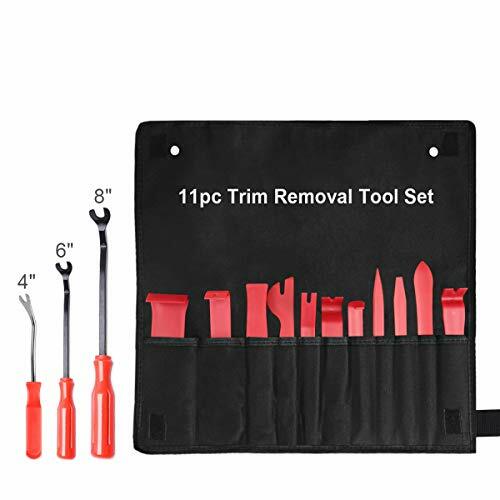 √14 PCS auto trim removal tools for automotive trim removal including stereo systems, fasteners, window, door panel, dashboard ect. √XOOL tool kit is mainly made of premium nylon and Mn-steel for its long-time usage. They are eco-friendly and non-toxic. √This product is designed in accordance with ergonomics. It allows you to use it with less effort and improve trimming efficiency. √XOOL trim removal tool kit is characterized by its fine workmanship such as clean edge, curved head and matte surface. √Practical 14PCS trim removal tool kit meet your various needs. It comes with a bonus portable bag for easier organization and storage. [Multipurpose] XOOL trim removal tool kit is excellent for automotive trim removal including stereo systems, fasteners, window, door panel, dashboard etc. It includes 11 trim tools in different types and 3 clip removers in different sizes. It also can be used to remove bicycle tire. This multipurpose and easy-to-use kit is a good choice not only for the professionals, but also or amateurs. It is your must-have replacement tool. [Premium Material] Made of nylon material and with matte surface treatment, XOOL trim tools are impact resistant, eco-friendly, non-toxic, lightweight and tougher than the common ABS ones. Our trim tools are gentler on softer surfaces, and will not scratch your car. Clip removers are made of Mn-steel and PC plastic, which makes them more sturdy and durable. With high hardness, they are effective for removing tough-stapled clips. Premium Material ensure its high quality and durability. [Ergonomics Design]XOOL trim removal tool kit is made in accordance with ergonomics design. The matte surface makes them comfortable to hold in your hands. The anti-slip and thick handle of the slip remover prevents it from falling off from your hand in the process the using. The comfortable and soft handle eliminates hand fatigue. With light weight and appropriate proportion, it allows you to use it with less effort and improve trimming efficiency. [Practical & Portable] XOOL trim removal tool kit is molded according to car trimming needs on the market, thus it works well and meets your needs. There are enough varieties (14 PCS) that allow you to choose the appropriate tools to handle the situation. This practical and economical kit comes with a bonus portable bag that makes it convenient to carry out and easy to storage. You will be satisfied with XOOL 14 PCS auto trim removal tool kit for sure. Publisher: Shenzhen Baishichuangyou Technology co.ltd. Studio: Shenzhen Baishichuangyou Technology co.ltd. If you have any questions about this product by XOOL, contact us by completing and submitting the form below. If you are looking for a specif part number, please include it with your message.